is made of 38 self-governing colleges, where students eat, sleep and have tutorials. The University is the main authority for administration of organizing curricula, examination, tuition fee, maintaining library and laboratories, other University properties like printing press, faculty buildings and conferring degrees of graduation day. has 38 colleges and 6 halls which have features such as gatehouses, potters lodges, quadrangles, gardens, chapels, dining halls, libraries and living accommodations for students. Some of the colleges are more famous than others due to their students who have become more famous. are the point of entrance into the older colleges, which has castle like big wooden doors and high towers (due to town vs gown riots). Usually, head of the colleges has their rooms on the tower to keep an eye on the people coming or going outside of the college. are located inside the gatehouse from where potter (guard) controls and supervises people or students. Quadrangles are rectangular arrangement of buildings made of student accommodation, chapels, library and dining hall. In the centre of the quadrangles are lawns which have a signKeep of the Grass. The Chapels are a unique feature in Oxford University Colleges. Chapels are T-Shaped with antechapel where extra altars and memorial. The Chapels have t-shaped seating so that choir and students can assist each other while singing medieval hymns. 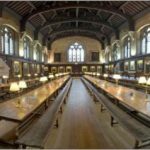 The Dinning Halls of University of Oxford have become very famous due to Harry Potter. Hall inside the colleges have dark wooden panels and paintings of colleges famous alumni and benefactors. Gardens inside the colleges are very beautiful. Earlier gardens were used to grow herbs, vegetables, orchids and small relaxing area for the students. Presently, gardens are used for walks and some colleges have gardens which has fountains, statues and ornamental flower beds. 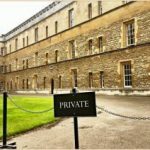 Some of the famous colleges of University of Oxford are given below. Christ Church College which has big quadrangles, chapel and dining hall. King Henry VIII took control of the Christ Church College after getting separated for the Catholic Church and gave control to Cardinal Wolsey. 13 British prime Ministers are form this college and Harry Potter was filmed here. Magdalen College was established in 1448 and it is the first college which is seen by tourist when they cross the Magdalen Bridge in Oxford city. Bell Tower is the most famous and beautiful view of the college which can be seen from the High Street. Brasenose College is located on High Street and tourist can visit college from Radcliffe Square . Mr David Cameron was a student of this college and this college was inspector Morse’s college in the series. Sir Richard Sutton and Bishop of Lincoln William Smyth founded this college. New College was founded in 1379 by William Wykeham and it is one of the biggest colleges of University of Oxford with 430 undergraduates and 360 graduates. 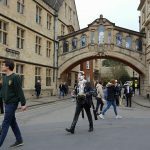 Tourist can visit New College from New College lane near the Bridge of Sighs . Merton College was founded by Walter de Merton in 1264. 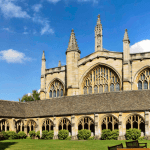 This college claims to be the first college of Oxford University .Merton College has many famous names associated with this college such as T. S. Elliot and J. R. R. Tolkien. St John’s College is known to be the richest college of University of Oxford . St John’s College has mixed architecture buildings from 15th to 20th century. Tourists can visit this college from St Giles Street. Sir Thomas White founded this beautiful college in 1555 to provide Catholic education to clerics while Queen Mary was in power and to Counter Reformation. All Souls College is a very unique college in University of Oxford . There are undergraduate students in All Souls College . The college was established in 1430 by Henry Chichele for the souls of the martyrs in the French Wars and benefactors. Exeter College was established in 1314 and has one of the most beautiful Victorian Chapels in Oxford . Tourist can visit this college chapel which also houses Star of the Bethlehem tapestry of William Morris and Edward Burne-Jones, who were students of this college. Jesus College was the only college in University of Oxford founded under the reign ofQueen Elizabeth in 1571. JesusCollege allowed women to join the college in 1976 which was considered to be very early as compared to some of the other colleges. Lincoln College was founded by Richard Fleming who was the Bishop of Lincoln and he founded the college in 1427. Lincoln College has two beautiful quads and 17th century stained glass in the chapel. Trinity College was founded by Sir Thomas Pope in 1555 in University of Oxford . Trinity College has Durham Quad which was built in 1421 and also has a library from 15th century. The college has large grounds but houses only approx. 400 students. Balliol College is located on Broad Street . It claims to be the oldest college of University of Oxford . John De Balliolfounded Balliol College in 1263 but buildings are Victorian. Wadham College was founded by Nicholas Wadham in 1602. Wadham College has lovely gardens.